A piece of frosty driftwood in the yard. I think this look means, BRRRR! Close up of some frost on a log. The sunrise cast everything in an orange glow, add the layers of frost, and it was a double dose of amazement. Did you really think I was going to write about writing? Or tell you some story? Nah, maybe when things aren’t as exciting outside. As if. 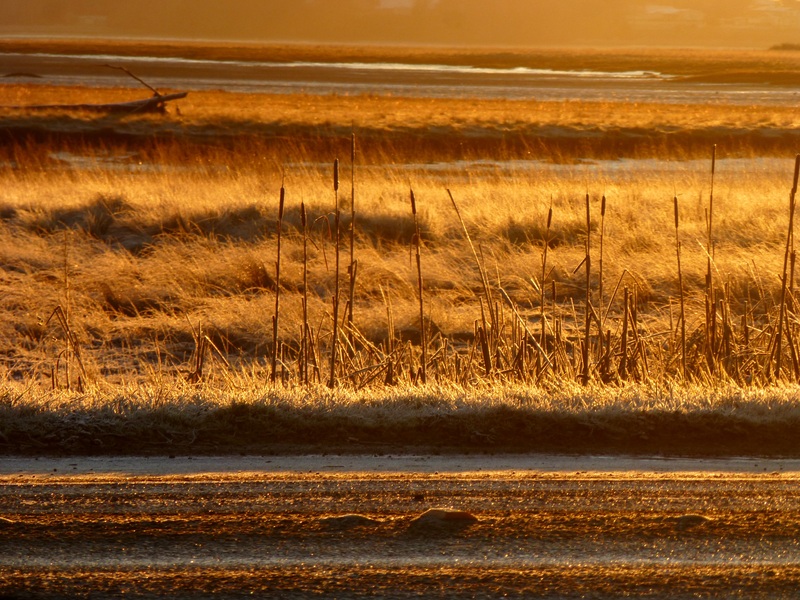 Icy road and frosty grass with orange sunrise glow. The biggest thrill was seeing the huge rolling waves and the way the weird orange glow made the driftwood and dune grass look. I was so startled by the beauty and power, I was exclaiming out loud. Freak! So glad that the gull was the only one in hearing range. That could have been embarrassing. Hey, maybe that’s why he wouldn’t talk to me…the gull, the one I posted on facebook..I’m so lost! Three waves, one after another! That’s Ocean Shores in the background. Another one that took my breath away. Ocean Shores in the background. 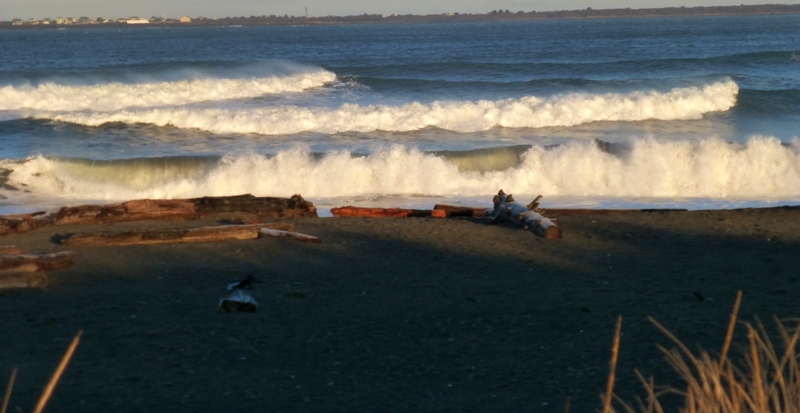 And the last photo is at frosty Bonge Beach in Grayland. 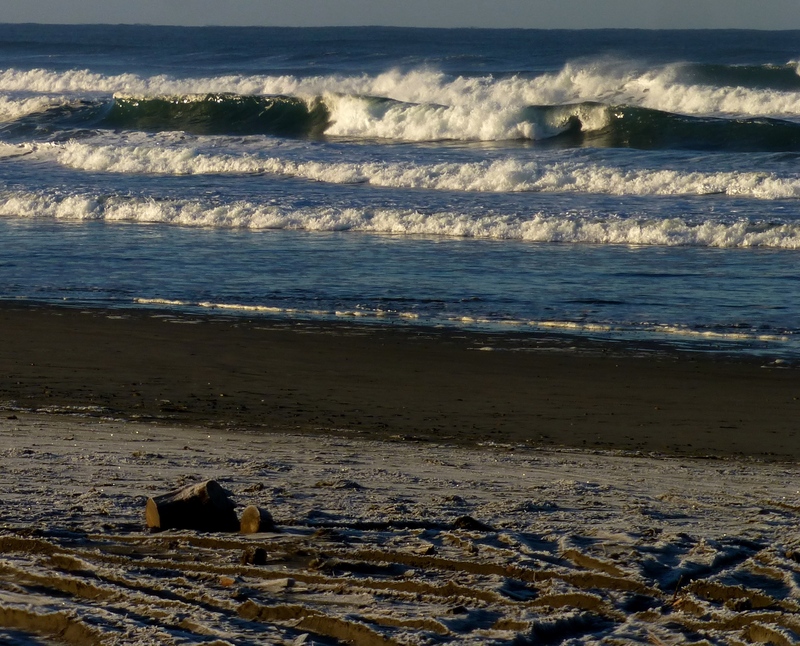 Frost on the sand here at Bonge Beach. More crazy wild waves. 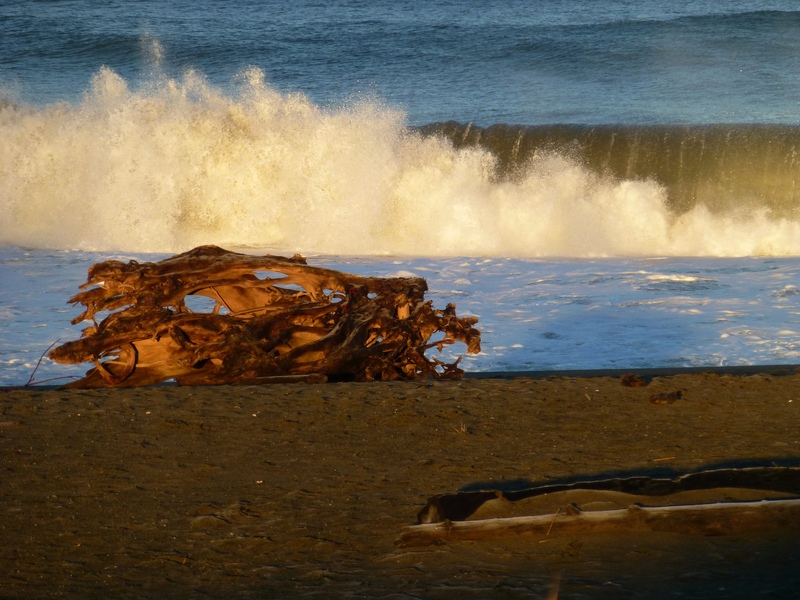 Categories: Challenges Prompts Contests, Phall Photos, Writing Journal | Tags: beach, frost, photography, Washington Coast | Permalink. What a glorious morning you had Patti. I enjoyed it too. Beautiful photos! Mike (an ex-surfer) loved the header photo of the wave. I don’t think I knew he was a surfer. At Alki? Glad you enjoyed, it was awesome! Thank you so much, it seems like magic to me. My kid’s dad was a photographer and i remember the time and work it took to get even one good shot—plus the hours in the dark room! We had a pure sunshine day, but brrrrr! Beautiful photos, Patti. Nicely done! Love the photos. 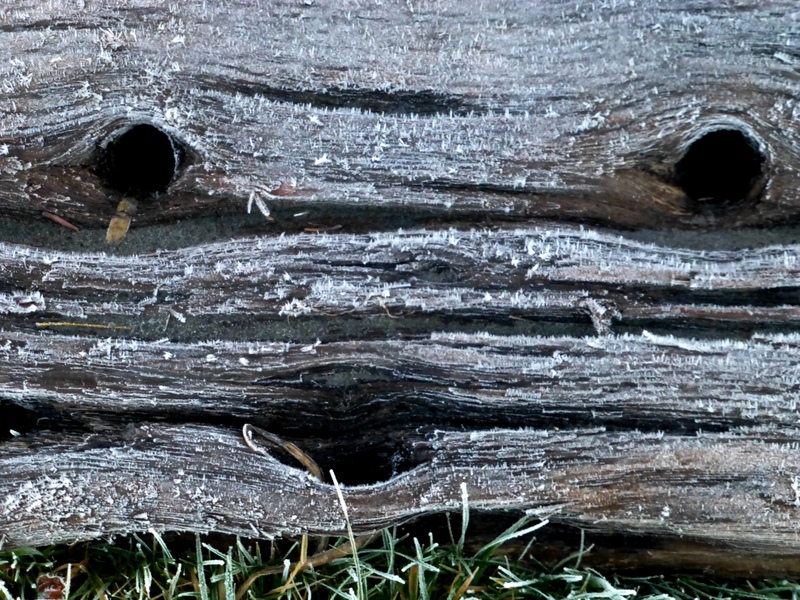 the driftwood is really pretty and I thought the frost was a field before you explained it was a close up of a log. You never cease to amaze me. When that came up on my computer I was happily shocked. I enlarged it from the photo on my site and was further amazed at the details of the crystals. Wow. Just wow. Thanks, for the visit and comments, Susan. You are way better than tolerable. You make me remember how beautiful the world is, to be happy I’m alive–now, in this life with its losses and struggles, beauties and surprises. That first wave will wash everything clean. Photos amazing. Sense of joy amazing. Writer amazing. Thank you, Patti. Amazing friends:>) I’m surely feeling the love now! Sending it back in droves! !